Hello all and welcome to The Queue! This is a brand new "blog" series taking over both SFFT Source and SFOT Source. We will go in-depth on many topics to help simplify and improve your visits and planning to both theme parks. What is the new membership system at Six Flags? Memberships are not new to Six Flags. However, they have completely revamped the membership system for the 2018 season and beyond offering multiple tiers. There are 4 tiers of memberships now. Think of it as a large hotel building. The bottom floors don't have such a great view. However, as you move up levels on the building, your view becomes more and more amazing. While each membership level works the same, the further you go up the tier the better your benefits become. Memberships are set up on a month-to-month payment plan. You CANNOT pay for a membership all at once. Memberships are like a Netflix subscription. The main catch is that you cannot cancel your membership until you've had it for at least 12 months. After 12 months you are welcome to cancel it at any time. Now that we have the simple stuff out of the way let's look at the main benefits of each membership tier. This can become quite overwhelming. We've picked out the best and most relevant benefits from each level. Working off of these benefits alone should ultimately help you decide which tier, if any, is the best for you. This is considered the bottom tier of the membership system. However, Gold Plus memberships still receive great benefits! Unlimited Admission - Gold Plus Members get unlimited admission to Six Flags Fiesta Texas...as well as all of the other outdoor Six Flags theme parks in North America, including the water parks. Gold Plus Parking - Never pay for parking again when you visit any Six Flags theme park or water park. Save up to $25/visit on parking! Priority Member Entry - Save time at the turnstile! Gold Plus Members enter the park first through the Member Only entrance during the first four hours the park is open each day. Save up to 20% on Almost Everything - Save 20% on almost all candy, merchandise, Deluxe Dining Plans, Season Popcorn Buckets and Season Photo Passes. also save 10% on VIP Tours, Cabanas, and tube rentals and 5% on all food and beverage purchases. Also save $5 on THE FLASH Pass and selected paid attractions. Save 25% on a Season Drink Bottle - Gold Plus Members get a 25% discount off the individual Season Drink Bottle price (it's a better discount than what you get when you buy 3 or more bottles). Discount Tickets for Friends Every Visit - You'll always save a minimum of 20% on all tickets for friends. Some days you'll save a lot more. First to Ride New Attractions - Whenever possible, Gold Plus Members get to try our new rides before anyone else! Member Appreciation Days - Members get special celebration days plus regular Member-Only exclusive ride times. Special Member Pass ID and more - Members get a very special gold ID card with Member lanyard, exclusive Member newsletter and access to our private Member Support Center. 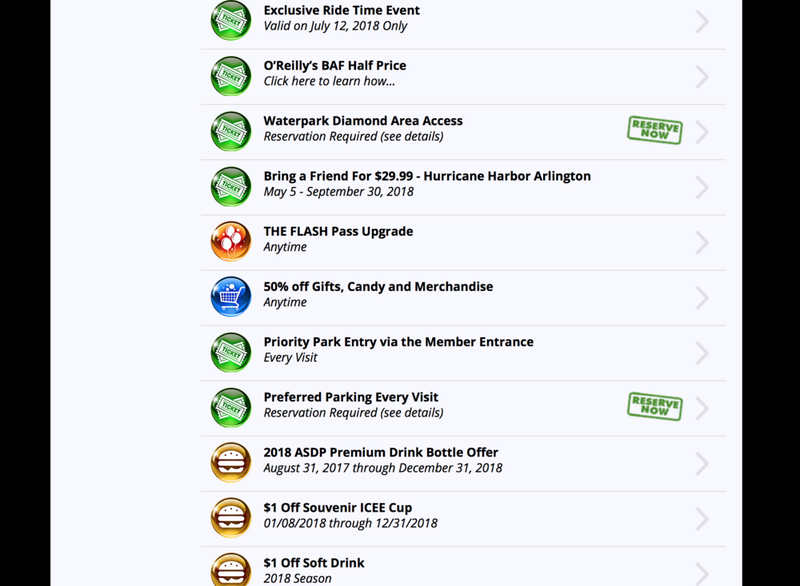 Most Benefits Valid at ALL Parks - Only Members can use almost all of their Membership benefits at ALL Six Flags theme parks and water parks (subject to availability). Bonus Benefits at Special Parks - Get bonus discounts on dolphin swims when you visit Six Flags Discovery Kingdom in San Francisco/Sacramento, or save on hotel room nights when you stay at the Great Escape Lodge in Lake George, NY. More to come! Your Membership also includes ALL Gold Season Pass benefits. This is the second level of membership at Six Flags Fiesta Texas. You receive all the great benefits from Gold Plus with the following benefits below. Unlimited Soft Drinks Every Visit - You'll get a collectible souvenir Member Drink Bottle you can use for unlimited soft drinks every time you visit. Save up to 25% on Almost Everything - Save 25% on almost all candy, merchandise, Deluxe Dining Plans, Season Popcorn Buckets and Season Photo Passes. Also save 15% on VIP Tours, Cabanas, and tube rentals. Also save $5 on THE FLASH Pass and selected paid attractions. Save 15% on Food & Beverages - Get a 15% discount on all food and beverages you buy from our restaurants (excludes only alcohol and drink bottles). One-Time Diamond Skip the Line Ticket - Get a taste of the Diamond life with a one-time, one-ride skip-the-line pass good for one major ride. 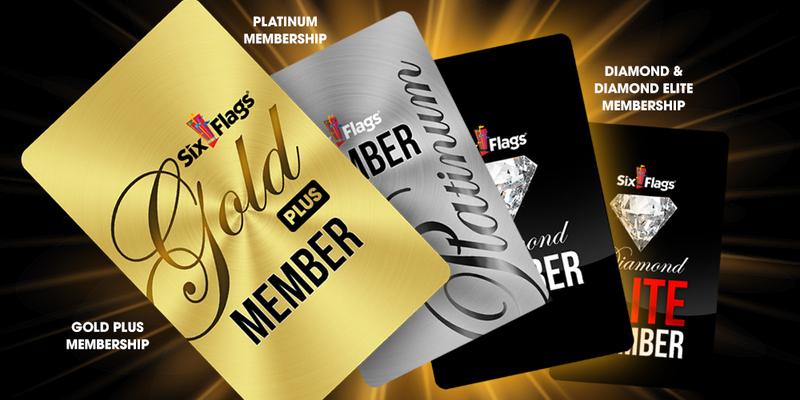 Diamond memberships are the third level of membership offered by Six Flags. You are probably noticing a trend by now. You will receive all benefits from Gold Plus and Platinum PLUS these below. Diamond Preferred Parking Every Visit - Start every visit right with a just short walk to the entrance from our Diamond Preferred parking area. Skip a Line Every Visit - Every time you visit you'll get to skip the line on one of the major rides in the park. Save up to 35% on Almost Everything - Save 35% on most food, beverages, candy, merchandise, Deluxe Dining Plans, Season Popcorn Buckets, and Season Photo Passes. Also save 20% on VIP Tours, Cabanas, and tube rentals. Also save $10 on THE FLASH Pass...and more! Waterpark Diamond Area Access - You'll get priority entry to our water parks plus exclusive access to our private Diamond-only seating area. Discount Tickets for Friends Every Visit - You'll always save a minimum of 35% on all tickets for friends. Some days you'll save a lot more. Premium Diamond Seating at Shows - At many of our shows you'll get to sit in a special area reserved just for Diamond Members. Diamond Elite Priority Preferred Parking - You'll get priority reservation access to our preferred parking area every time you visit. Skip Two Ride Lines Every Visit - Every time you visit you'll get to skip the line on two of the major rides in the park. Save up to 50% on Almost Everything - You'll pay half price for just about everything in the park, including most food, beverages, candy, merchandise, Deluxe Dining Plans, Season Popcorn Buckets, and Season Photo Passes. Also save 30% on cabanas and tube rentals, 25% on VIP Tours, and get $15 off the THE FLASH Pass...and more! Discount Tickets for Friends Every Visit - You'll always save a minimum of 50% on all tickets for friends. Some days you'll save a lot more. Premium Diamond Elite Seating at Shows - At many of our shows you'll get to sit in a special area reserved just for Diamond Elite Members. We know this is a lot to take in. Can we simplify it even more? Of course! These are probably the most common benefits that you are going to use while planning a normal visit to the park. Here's how they are affected by each membership tier. Platinum through Diamond Elite comes with a souvenir cup with no additional cost. Gold Plus - not available. Platinum - skip one ride line one time. Diamond - skip one ride line every visit. Diamond Elite - skip two ride lines every visit. Not available on Gold Plus and Platinum. Reserved Preferred Parking available for Diamond. Reserved Priority Preferred parking available for Diamond Elite. Diamond and Diamond Elite members only (by reservation). Diamond and Diamond Elite members only. Please note that all membership levels get priority park entry. All visitors with memberships get specialized membership cards as well. These benefits are valid at all Six Flags parks. Ticket discounts for friends are only valid at the park in which you purchased your membership. One incredibly important thing to remember: dining discounts do not apply to non-managed restaurants and alcoholic beverages. What does this mean at Six Flags Fiesta Texas? You cannot get a food discount at Panda Express (as the restaurant is not "owned" or "managed" by Six Flags) and you cannot go to a place such as Thirsty Buffalo Saloon and get a discount on a beer (as alcohol discounts are against the law). It is important to look at pricing options with some of the discounts involved. While pricing for purchasing just the membership is very straight-forward, if you begin to add benefits such as a Dining Pass or a Photo Pass the pricing begins to vary. Here's a look at the most common membership/add-on combinations. These prices are as of June 2018. Pricing can change at any time without any notice. All pricing is assuming that you put down a $20 refundable security deposit. If you don't plan on doing this, add $1 to each of the price levels below. Pretty crazy how the pricing fluctuates depending on what you add to the membership, right? We thought this was a very important aspect when deciding what tier to purchase. If you are wanting to add a Dining Pass you'll definitely not want to purchase a Gold Plus membership. The same goes with member Flash Pass. We will let you decide what works best for you. What if I already have a season pass or old membership? Can I switch/upgrade? Yes! It is a pretty straight-forward process as long as you have built an online account to manage your season pass or membership. Prior to April you were actually able to "upgrade" your season pass and get a pro-rated in-park credit to make up what you had spent on that season pass. Unfortunately this is no longer available. You can still, however, follow the upgrade steps online with a season pass. The same goes for a membership. Once you upgrade a membership they will simply cancel your old one. You also don't have to pay processing fees for the new membership. Keep in mind that upgrading your membership puts you on a brand new 12-month plan. The screen shots below show you how easy it is to upgrade a pre-existing membership. Visit http://mypass.sixflags.com and log in with your membership information. Once logged in you will come to a page very similar to this (please note that I've already upgraded my membership so yours may look a little bit different). Simply click on the "Upgrade" link that is highlighted on the left side of the page. Once you click "Upgrade" you will be brought to this page. Pick the option that applies to you and follow the prompts. This is very simple but make sure you read all directions carefully in order to upgrade successfully. Which membership level should I buy? The first question you have to ask yourself is, "do I even need a membership?" Many people do not like the idea of a monthly payment pass. In this case I would recommend purchasing a season pass. Just keep in mind that season passes do not have the types of benefits that memberships do. Obviously if you only visit the park once or twice a year then a membership is not for you. Are you planning on purchasing a member Dining Pass or member Flash Pass? I would not go with a Gold Plus membership. The best value for your dollar in this case is Platinum or Diamond. If money is not a concern to you then I highly recommend going with Diamond Elite. I've been a Diamond Elite member for a few months now and can honestly say that the reserved parking and skip-the-line passes alone make the membership level worth it to me. This doesn't even take into account the 50% discounts you get on almost everything in the park. What benefits have to be reserved and how do you reserve said benefits? The two main benefits that have to be reserved prior to your visit are water park diamond area access and preferred parking access. These must happen prior to 9am on the day of your visit. It is also important to point out that sometimes these can fill up ahead of time so I recommend reserving parking at least half a week in advance and trying to reserve water park diamond area access sometimes even more than a week in advance. Please note that these two benefits are valid only for Diamond Elite and Diamond members during each visit. Platinum members get to use the parking benefit one time. First, log into your membership portal. The main page after login shows all of your member benefits. Scroll until you find "Preferred Parking Every Visit" and click on this option. Once you click this option a box will open up. Please read the information carefully and then click the "Reserve Parking" button at the bottom. The next page will ask you which park you would like to reserve at. Pick your park and hit "Continue." Please note that your reserved parking is valid at all Six Flags theme parks and outdoor water parks. Next up, you will be taken to a calendar. As you can see in our screen shot all remaining dates in June are fully available. The boxes will be yellow if there is limited availability and red if there is no availability. Pick your desired date and click "Reserve." After you've picked your date you will be taken to this page. Make sure the information is all correct and hit "Agree and Confirm." Finally, you are taken to the confirmation page. Click "Print Confirmation" and print off the voucher. Take the voucher with you to the park and present it at the parking booth when you arrive. They will direct you to the appropriate parking lot. Just like parking, log into your membership portal online. The first page you see will be the benefits page. 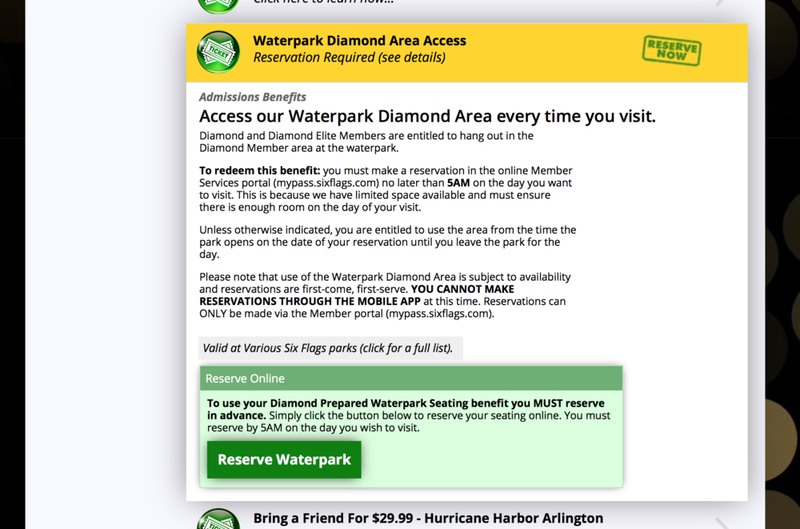 Scroll down until you find "Waterpark Diamond Area Access" and click on it. Once you click a box will open. Read the information carefully and then click "Reserve Waterpark." Next you will pick the park you'd like to reserve at. In this case we are picking Fiesta Texas. Click "Continue." The next page confirms your name and also allows you to add other pass holders. Please note that your friends have to have their own reservation to enter the area. However, Six Flags is allowing you to make the reservation for them on this page. Fill out the information and hit "Continue." The next page will have you confirm a date. As you can see the water park access fills up very quickly so you will need to plan way ahead of time to get the date you'd like. Pick your date and hit "Reserve." The next page will confirm your date and park. If everything looks fine hit "Agree and Confirm." The final page will confirm your reservation. Click "Print Confirmation" and print out the voucher. Take the voucher to the park and present it to the entrance of the water park diamond area access. What are all my benefits as a member? I know we have only covered the main benefits of each membership level. If you are interested in seeing how all the benefits compare between each membership level we recommend clicking the button below and checking out the membership comparison chart provided by Six Flags. The best thing you could do is ask questions in the comments below! We check them regularly and there is a strong possibility other visitors of our website can help you out, too. You can also connect with us on our social media accounts. Secondly, we recommend checking out our Visit Planner page. Our Visit Planner is a great way to plan a visit to the park and read information in a constructive, simplified manner. You can access this by clicking the button below. Lastly...we actually made a video very similar to this post on our YouTube account that may also further help you with understanding the current membership setup at Six Flags that can be viewed below!